First Response are a locksmith company covering central England. This was a brand new entry online for First Response which needed to stand out from the crowd, be easy to use and provide alot of engaging material for customers to get a feel for the way First Response conduct themselves and the services they offer. We worked closely with First Response to create the vision they had for their company website and continue to roll out updates to help increase the coverage of the website in the search rankings. 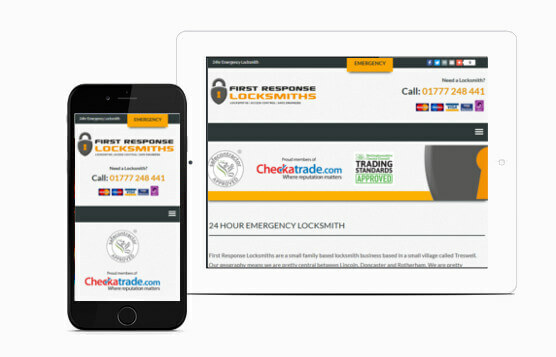 A good mobile adaptation is always important for Locksmith websites because a large percentage of hits are from mobiles so we made sure the important details were availble in view and quick to load.